Last season the Yankees second baseman tied for last in the major leagues in WAR, at -1.2. Stephen Drew was a mess, hitting just .201, and the Yankees showed little confidence in prospect Rob Refsnyder to step in. The team acquired Dustin Ackley late in the season, and the expectation going into 2016 was an Ackley and Refsnyder platoon. At the Winter Meetings, Joe Girardi said he was “comfortable” with this arrangement, but certainly didn’t seem thrilled. The Yankees, just an hour after these comments, made their second big trade of the offseason, trading pitcher Adam Warren for Starlin Castro, who is the team’s new starting second baseman. Adam Warren, 28, profiles best as a swingman, and he filled that role last season for the Yankees. Under team control until 2019, he had a 3.29 ERA in 131.1 innings, with 17 starts. The swingman tends to be undervalued in the majors, and Warren was a savior to the bullpen, providing stability and a bridge to Dellin Betances and Andrew Miller. He was stretched out this offseason, and could have been a fourth or fifth starter for the Yankees in 2016. Warren earned 2.7 WAR last season, and 1.4 the year before while being used exclusively as a reliever. Ryan is an elite glove at shortstop, but was unlikely to see much playing time behind Didi Gregorious. He’s also injury prone and lacks any semblance of a hit tool. His inclusion in the deal was most likely just to balance money. Starlin Castro broke into the league as a 20-year-old, flashing a plus bat and plus speed, along with modest power. The Cubs hoped he could develop into a top bat with 15/20 potential at shortstop. Like many top prospects, he did not live up to expectations, but that doesn’t mean Castro was a bust. Now, just 25, Castro has an impressive 991 career hits. He also has a .281 batting average and .321 on base percentage. Castro does not run as much as he used to, and has just nine steals over the past two seasons. He also has struggled making routine plays at shortstop, profiling ideally as a second baseman. 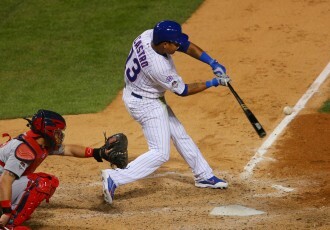 Castro also disappointed last season in the first half, eventually being benched by the Cubs. He bounced back big time in the second half though, and had a .295/.319/.464/.783 slash line after the All-Star Break. Should Castro be able to pick up where he left off in 2015, the Yankees can expect above average production at second base from Castro. While not a wizard with the glove, he did have two defensive runs saved in his first year at second base in 2015, and has the talent to be an above average player on the field. As mentioned before, Castro is only 25, despite being in the big leagues for six full seasons, and is signed to a reasonable contract through 2020. He earned just 0.8 WAR last season, but 2.8 in 2014. Strictly comparing WAR values, this looks like a steal for the Cubs. In reality, though, it looks to be a very good deal for both sides. Warren is likely to be a swingman for the Cubs, and while a reliever that doesn’t pitch in the eighth or ninth inning can only be so valuable, his presence will be missed in New York. Castro fills a serious position of need for the Yankees, and provides an athletic and young duo with Didi Gregorious in the middle of the infield. Brian Cashman has stayed true to his word to get younger and cheaper, and Starlin Castro is certainly a more appealing option than free agents such as Ben Zobrist (now signed to the Cubs), Daniel Murphy, and Howie Kendrick. Castro is riskier than Warren and has had his fair share of ups and downs over his career, so there’s a chance the bottom falls out on this deal. Castro also has plenty of upside, so the risk/reward balances out pretty evenly. The Yankees will really see a difference now at second base, with hopefully receiving some positive production at the position. All in all, this trade works out the way trades should work out, with both teams filling needs and swapping similar value players.